All About the ALSOPS: My Eating Walking Machine! One of Lexi's happiest moments of the day...EATING!!! I don't think I've ever met a 1 year old who could eat more than Alexis. She never acts full and truly enjoys her food. 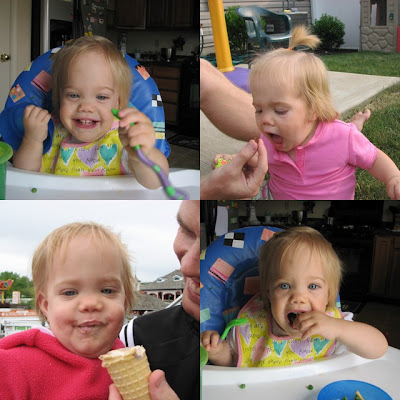 She definitely has some Hockenjos genes there. If anyone in the room has food (even if she just finished eating) she comes waddling over as fast as she can with a grin on her face or with her mouth wide open. You gotta love her! If I even open the pantry door she starts kicking her legs and making her funny grunting noise as she anticipates what I may bring out. I can't believe how fast she is growing up! My little baby took her first steps on Kylee's birthday and now pretty much has the hang of it. It has taken me forever to get this post up. I know family has been asking to see some video of her walking. This clip has her first steps from a few weeks ago, a little in the middle and her current walking from this evening. I know it is on the long side but we've had fun watching her progress. Don't mind my high pitched squeels at the beginning. What can I say I am a proud excited Mom and Kylee is right along with me. We love watching her accomplish every milestone. She is still doing great and pretty much on track. She is very proud of her walking skills and her big belly! She is into everything right now and is developing quite the little personality. I think Lexi is really starting to look more like Kylee. She is so cute. She looks so proud of herself in the walking videos. I LOVE it. She is so dang cute. She's cruisin'! I love your excited squeals and think it is so cute to see Kylee getting so excited and happy about Lexis' accomplishment. Zanna loved the card from Kylee and we just love you guys! Her walking with her belly leading the way is the cutest thing! thats so cute, congratulations! and that is so sweet how kylee helps her and is just as excited! loved watching her stick her belly out in the video too, how funny! Congrats at attempting to rid the world of ugly people by having two beautiful girls. I was talking with jason Taylor the other day and we were both wondering about the Sky-box. anyway hope you are having a great time in the hershey. wow looks like lexi is doing soo good!!! I'm so glad!! her lil belly is so cute! !